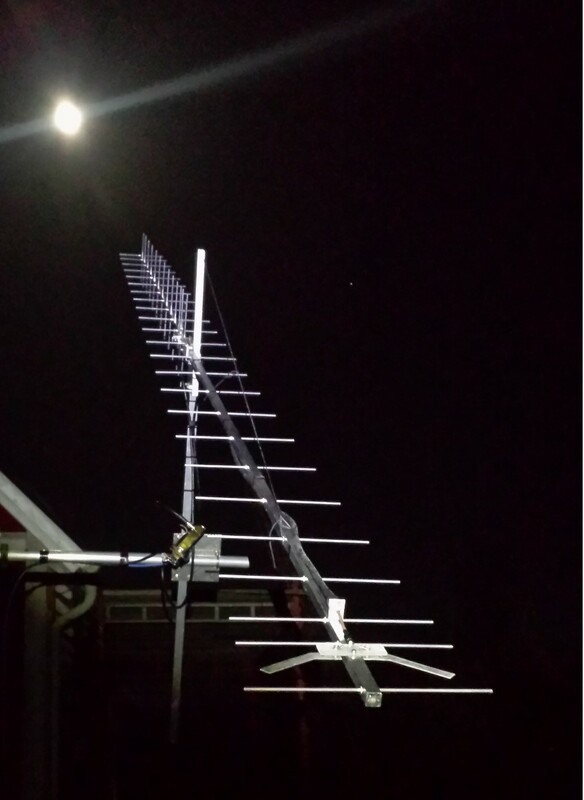 Long time since the last update but the weather has not really cooperated with the efforts of antenna evaluation. The YBN 25 el and 14 element combo ( The Rainmaker) is completed and I and John ZS6JON has done some promising tests. John transmitted on his Rainmaker and I could easily detect him when he transmitted on the V 14 el part and I RX on my 8 times 25 el. but nothing what so ever when he used the Horizontal 25 el. 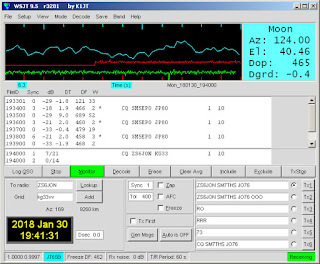 Dan HB9Q had his RX chain and reported to Livecq and the results corresponds very well to the estimations. So an overall very successful first test of Johns antenna. I just listened on my as I did not fit a TX relay to the setup and at the time there where only EU stations active and the pol was close to H all the time. Did hear both SM5EPO and S51LF easily on the single 25 el and compared to the 8 times 25 el showed actually quite small difference. First decode is with the 8 times 25 el and the last two with a single. My conclusion is that the single works well and I have something not fully OK in the 8 25 el array at the moment. We have had a lot of rain this fall and winter and its not completely impossible some has made its way into a connector or cable. 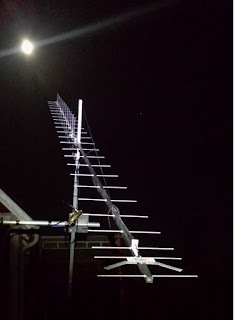 It really does not matter as the antenna works OK and I have already planned to rebuild the feeding to open wire feeds. The vertical parts that I also most likely will add will have coaxial feed-lines so I need to check what has happen with these to avoid problems in the future. The forecast is that the temperature is going down but I hope I can make some more test during the weekend when the dec is still high and window to the US and more shifted polarization.